Self-massage and stretching on a foam roller, clearly demonstrated on two posters—one for the upper body and one for the lower body. Now you can have the most popular exercises from the best-selling book, Foam Roller Techniques in one convenient poster set. 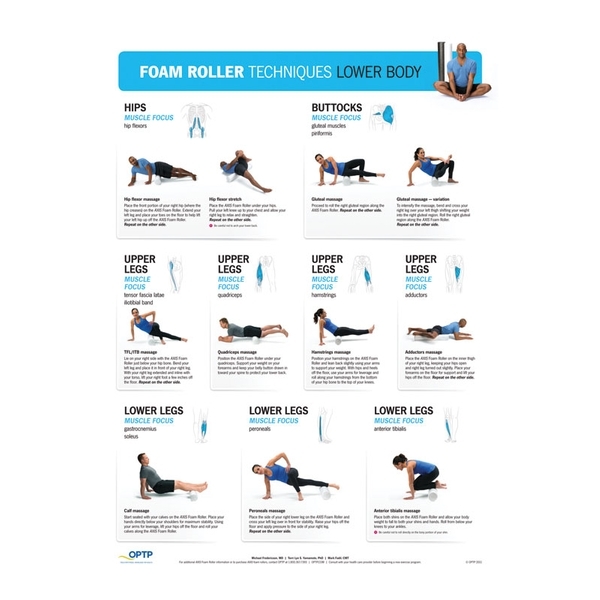 Broken down by upper and lower body exercises, this 18" x 24" poster set is an ideal resource for fitness centers, rehab facilities, at home, or at the office. Each exercise features descriptive instructions, clear photography and an anatomical illustration showing the targeted muscle. My personal trainers recommend this poster to use with my foam roller. It’s an excellent resource with easy to follow instructions, recommended exercises and pictures.